Hi all, I have relied on this site heavily over the past few weeks so I am hoping someone could help me out. 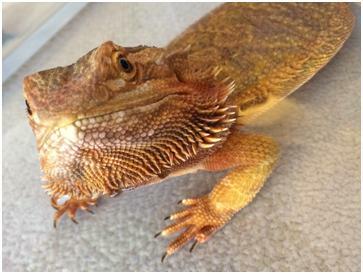 I rehomed my first bearded dragon recently. He came from a family who had been neglecting him, he was no longer used to being around humans, was not regularly fed and was very nervous and skittish but has never been aggressive. I am told he hatched April 2012 so he is 2.5 years old. He is approx 15 inches nose to tip. His name is Franco. We got him on 29th September, he was already shedding. He settled very well when we first got him, he was happy to be handled from the second day, loved racing around his tank and climbing, and he regularly came out of his tank for a wander around. He was eating leaves and pellets every day and pooping at the same time every day. He had locusts twice per week and always ate them all (6 - 8 locusts at a time). He loved to bask on his log under his spotlight. Over the past week he has really changed. His eyes look slightly closed. He is hardly eating, he will eat a couple of locusts but ignores the rest. He has stopped pooping in his tank, he only poops if I bathe him which I am doing daily to try and help his skin. 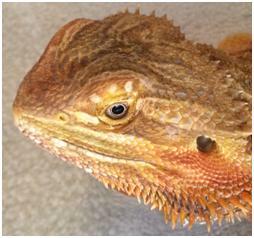 He is still shedding - it's now been at least 3.5 weeks plus however long he was shedding with previous owner. Also he hardly moves, does not come out of his tank voluntarily and struggles if we try to handle him. He rarely sits under his basking lamp. 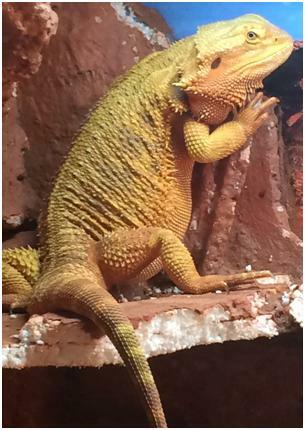 His sleeping position has also changed, he used to happily sit on a shelf and look out of his tank til he nodded off. Now he tucks himself away in a corner and hides his head, he sleeps almost standing up. I noticed his body was very swollen earlier so I have included pics of this. Tank temperature has not changed, around 100 in basking area, 85 - 80 elsewhere. 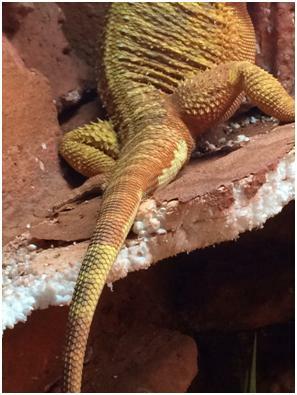 Viv length is 48 inches and has bark chippings substrate. I have just bathed him and he pooped in the tub, I have taken pics of it but haven't attached in case this is TMI - will share if this will help with advice. It seems to contain pieces of locust, last time he ate locusts was 4 days ago. I have included as many pics as possibly, tried to get some close ups of his face as I think he has signs of dysecdysis which is why I started bathing him regularly. He is very patchy on his tail. I used to keep one tank door open if I was in the room as he loved wandering about, but now I have read that low humidity could be responsible for his poor shedding so I am keeping him in his tank with doors shut and have moved his large water dish nearer his spotlight in the hope the evaporation will help. I also mist him once a day. Any help or suggestions would be greatly appreciated. Will gladly take him to a vet immediately if needed, I am just nervous of taking him out of his tank and into the car as he found the journey here very traumatic. Many thanks in advance for any advice you can offer. If that belly is as swollen as it looks I'd be off to the vets straight away. The lethargy is quite probably due to brumation, but personally I'd be getting him checked by a specialist. Sorry I can't be more helpful than this.